Ranked the top municipally owned golf course in Kansas by Golf Digest, Buffalo Dunes also earned accolades from Golf, Golfweek and Travel & Leisure magazines for “places to play” and “best bang for the buck.” Nestled among rolling sand hills, the 18-hole, par-72 course features bluegrass fairways, bent grass greens and native grasses. The course plays at differing lengths based upon skill level, with yardages from 5,452 to the championship tees of 6,806 yards. Every golf club in the bag might be needed at this 18-hole course that spreads across 315 acres in the Flint Hills and features two ponds, numerous creeks and native prairie tallgrass outside the fairways. To honor nearby Kansas State University, five of the 92 bunkers are purple sand, including one in the shape of a wildcat’s paw. Five teeing areas at each hole allow golfers to determine the length of the hole. 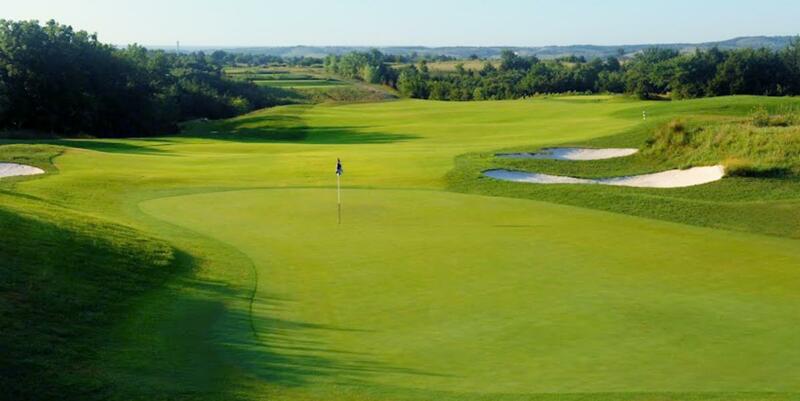 Golf.com and GolfLink.com have ranked Colbert as the top course in Kansas. Named for the Sand Creek that borders several holes and Newton’s history as a train stop, the course hosted the 2014 U.S. Amateur Public Links Championship. The course’s 10th hole, aptly named “The Beast,” is a par-5 stretch of 648 yards, hailed as the longest in the state. The 16th hole replicates the famous “Road Hole” at St. Andrews, Scotland. The recent reseeding of the tee boxes and fairways to Zoysia grass provides a quality playing surface on this 160-acre course with views of the Flint Hills. Trees, 29 sand bunkers, and six ponds challenge golfers of all levels; a player must hit the ball over a pond to reach the green on the second hole, a par 3, and around a big oak tree on the left center of the fairway approaching the 17th hole, a long par 4. Named one of the top-100 golf courses in the nation by Golfweek magazine, this Prairie Band Potawatomi Nation course was intentionally designed to retain all of the land’s natural elements with minimal disruption. The par-72 course, with natural bent grass greens and fairways with fescue rough, features seven holes in the prairie and 11 holes of natural creeks, rolling hills and trees. The 18th hole offers a double fairway and a shortcut for the gambler. Named one of the best public golf bargains in the country by Golf Digest, this course’s walking green fee is just $20 for 18 holes for an adult playing on non-holiday weekdays. 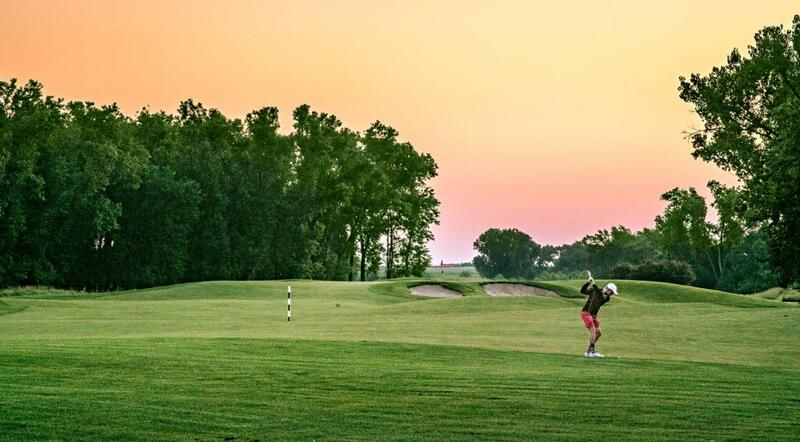 Located in the Flint Hills, the course features rolling terrain and Zoysia grass fairways. Golfers find the third hole a challenge with rough, sand, trees and native grass on the right and a creek running along the left and through the fairway. Plus, the landing area for this par-4 hole is only 25 yards wide.